One of our biggest nightmares in the modern world is losing our phone data either by misplacing our phones, when they suddenly get spoilt or in some instance when someone steals them from us. More often than not, it's not the actual phone that worries us the most, but the trove of personal data that we have on them, which often contains our most sensitive files such as family pictures or even assignments from work. Thankfully, if you are using an iOS device, iCloud gave iPhone users the option to backup entire data on device even when you have no computer at hand (only if we are able to connect to network) and restore it whenever we need. So what are your best options when you have to download apps from iCloud? Well you have the choice of either taking a blanket approach ( that's to restore everything from the previous backup) or taking a more strategic way--restoring selective data, which may be a better solution sometimes. Losing your phone data for whatever reason can be excruciatingly painful, as there are certain files, or documents that we can absolutely not afford to lose. If you find yourself in such a precarious situation where you need to restore certain data on your iOS device but don't want to restore everything, then the highly innovative and super easy-to-use iMyFone D-Port Pro software is what you just need to use. iMyFone D-Port Pro is a dedicated backup/restore app for iOS devices that works with almost all iOS devices including iPhone 8/iPhone X. 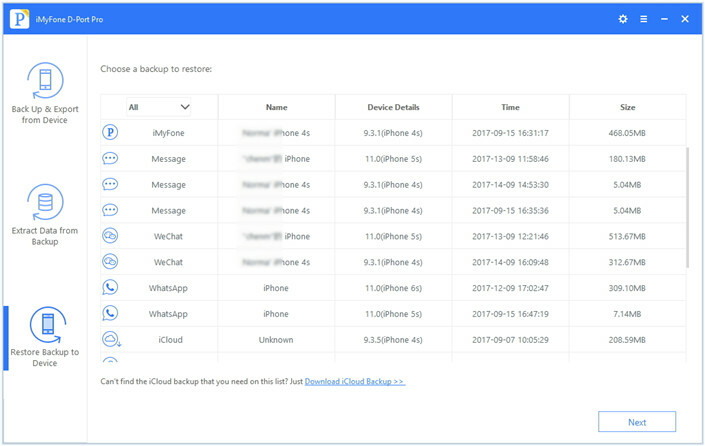 It not only allows you to backup or restore your iPhone, it also enables you to target a specific app such as Messages, WhatsApp, WeChat that you prefer to backup on your computer or transfer to another iOS device without affecting other data on your device. 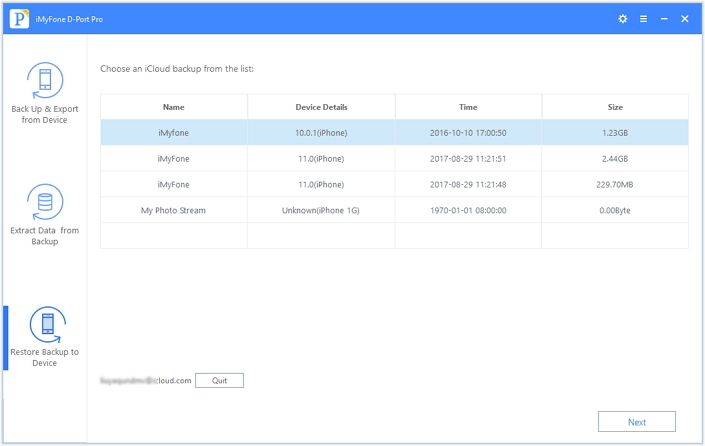 iMyFone D-Port Pro allows you to restore some apps from an iCloud or iTunes backup or extract 18 types of data in your iCloud and iTunes backup to computer. The backup made for iOS 11.2.1 is also supported. Using D-Port Pro is very easy, just install it, plug in your device on your PC and open the D-Port Pro application. Step 1. Once your iPhone is properly connected to the app, you can use any of the 3 options at the left hand side of the App for your purposes. In order to restore your preferred data, select "Extract Data from Backup" which is the second option on the column. Step 2. This will take you a list of all the back-ups that are on the system, locate the one you are interested in and click on it. If you never downloaded any iCloud backup on your computer. Just click "Download iCloud Backup". Then you will need to enter you iCloud account information. Step 3. Then the program will show you all your iCloud backups. Choose an iCloud backup and click "Next" to proceed. 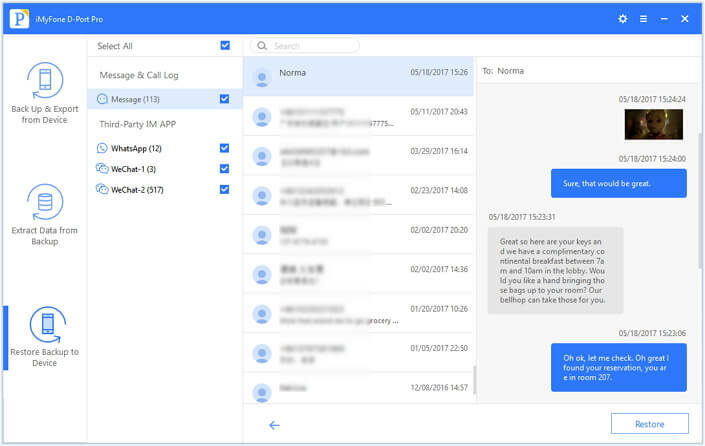 Then it will show you all the individual data type you can extract from that backup, ranging from third-party apps like WhatsApp, photos to contacts or call history. Choose the ones you are after and click on "Next"
Step 4. The next page will take you to the page where you can easily view the selected data from the backup to make sure you have what you need. If satisfied you can easily export them to your computer. You can also use iMyFone D-Port Pro to restore certain apps from iCloud backup to your iOS devices. 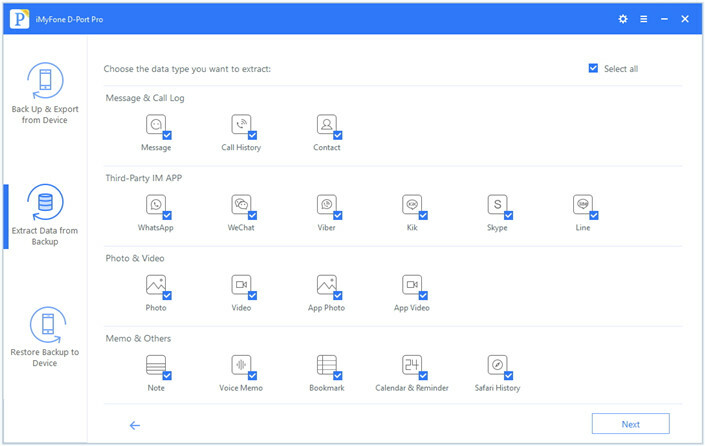 Now this tool only supports to restore WeChat, WhatsApp, Messages to iPhone, iPad or iPod. More apps will be supported in the next version. Here we will show you how to restore or download apps from iCloud to your iPhone without overwritting the other data on your device. Step 1. Open the program and click "Download iCloud Backup". If there is a iCloud backup, you can just choose the backup and continue following the on screen instructions. Step 2. 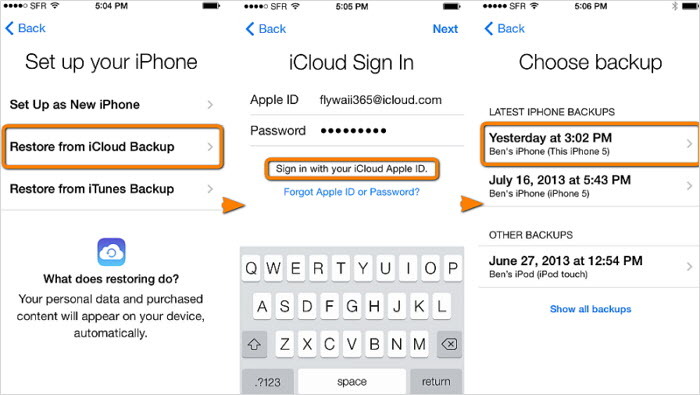 Then you need also to enter you iCloud ID and password to access your iCloud backups. You can choose a backup file from the list. On the next screen, choose a type of data that you want to restore and click Next to proceed. Step 3. 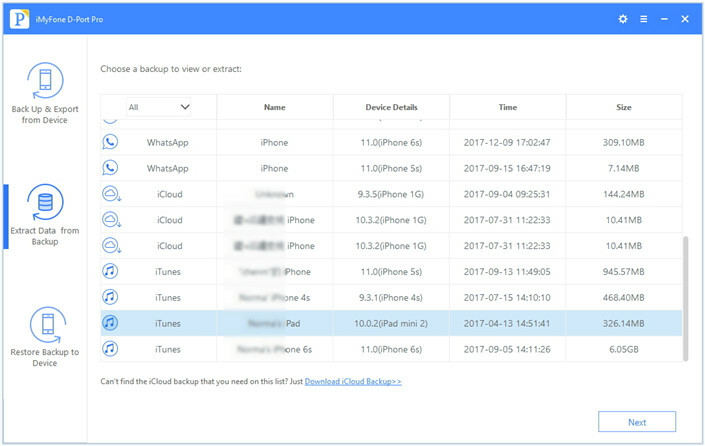 After download and scanning your iCloud backup, the program will show the details of the data types you have chose. You can check what you want to restore and click "Restore" button. Step 4. 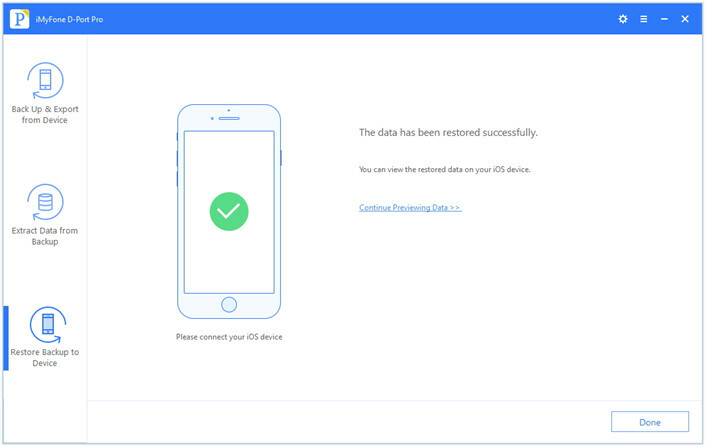 Wait for a short while, the app data will be restored to your iPhone. The first step is to wipe out the phone or tablet completely as this is the only way this method will work. You can do this by scrolling to the "Reset" section of your device setting and choosing the "Erase All Content and Settings" option therein. Swipe the "Hello" page you see on the phone, once this process is done, and follow the prompts till you reach the "Apps & Data" page. 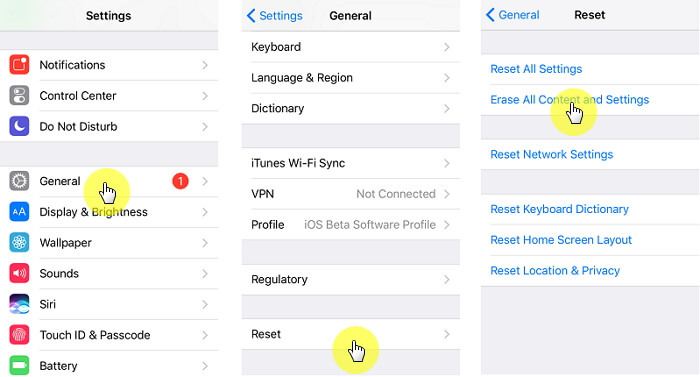 Choose the first option on this page which is "Restore from iCloud Backup". 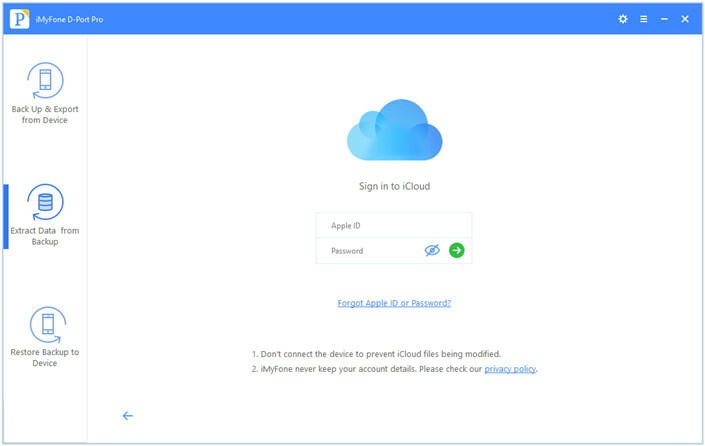 Log in to you iCloud using you Apple ID credentials. 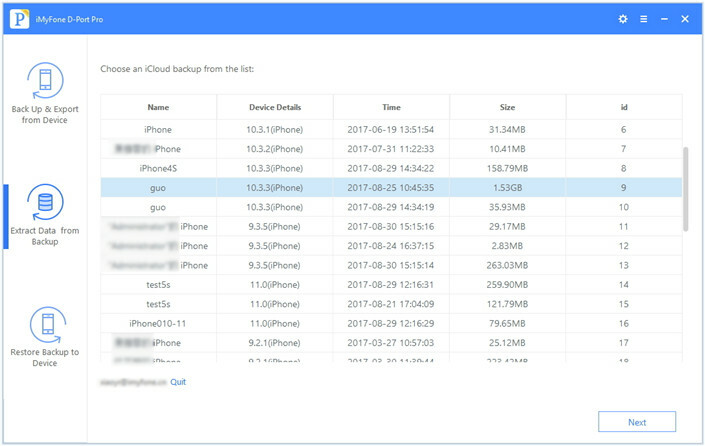 Locate the backup you are interested in by noting each backup's size and date. Tap on your chosen backup which should begin the transfer process. In case you bought apps or made other purchases using multiple Apple IDs on your device, you will be asked to sign-in on all of them to enable the process to complete itself. The process might take anything from a few minutes to up to an hour to conclude depending on the size of your backup and internet speed. Should you temporarily lose connection, the restoration will automatically pause, until connection is restored for it to continue. Wait for the progress bar to get full, which indicates your iCloud restoration is complete, after which you can go ahead and start enjoying you newly restored iOS device. While the traditional way of restoring apps and data through iCloud has been a saving grace for millions who have lost their iOS devices or lost some data on their device, it is also very important to note that not everyone needs all the data from their older devices to be restored to a newer one, or would want to lose precious new data on their present iPhone, therefore selectively restoring iPhone from iCloud backup would be a better choice. 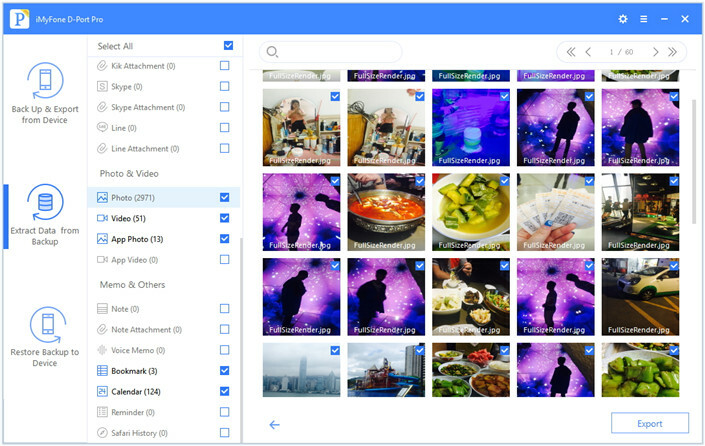 This is what iMyFone D-Port Pro offers, a flexibility and easy-to-use tool to restore only that which we need without wiping as much as a single photo on our present devices. We hope this article helps you.